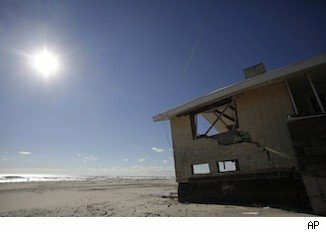 It sounds like the premise for a new reality TV series: "Hurricane House" -- people scouring waterside communities looking to buy homes damaged by Hurricane Sandy at a deep discount. While there are bargains out there, ranging from 10 percent off pre-storm prices for upscale homes on New York's Long Island and the Jersey Shore to as much as 60 percent off modest bungalows on Staten Island and Queens, it's still very much a game of buyer beware. Not only are buyers on the hook for repairs and in some cases total rebuilds, they're also wading into a host of potentially expensive uncertainties about new flood maps and future insurance rates, zoning changes and updated building codes. "It's totally changed the way I sell real estate," said Lawrence Greenberg, a sales associate with Van Skiver Realtors, whose own Mantoloking, N.J., office was wrecked in the storm. 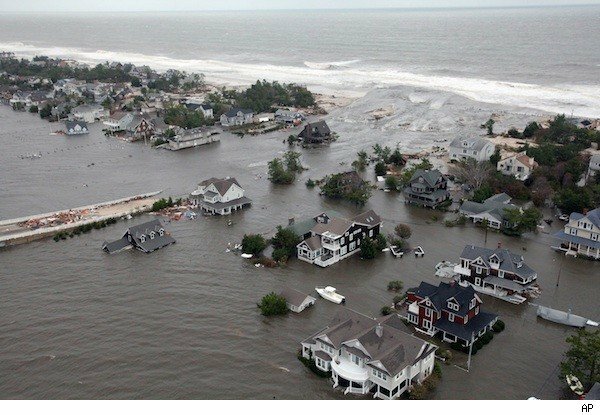 Prior to Sandy, prospective buyers rarely mentioned issues such as flood maps and building elevations until the matter of flood insurance came up -- often at closing. "Now, everybody asks the question of elevation," Greenberg said. Even if potential buyers plan to tear down and build new, they ask about the pending changes in flood maps proposed by the Federal Emergency Management Agency, because flood insurance rates will depend upon the new zones. There is no sign of a mass exodus from shoreline communities. The number of for-sale listings in January in the 380 Zip codes hit by the storm was about 2 percent below the same time last year, according to online real estate information company Zillow. That indicates that most homeowners are rebuilding, or have not yet decided how to proceed. But real estate agents in New York and New Jersey say the majority of homes for sale in these areas have some damage from the Oct. 29 storm, and it appears to them that a rising number are being put on the market as the spring home-buying season approaches. New listings range from destroyed oceanfront properties being sold for the land, to flooded bayside homes untouched since the storm that must be gutted. Even the few undamaged homes in affected neighborhoods are listing at prices about 10 percent lower than they would have been pre-storm. Some sellers are overwhelmed by the daunting prospect of restoring a damaged home. Some are older homeowners who had stayed in the houses where they raised their families, but now are relocating. Some didn't have flood insurance. "They either don't have the funds or don't have the energy to go through the renovating and rebuilding process," said Jeff Childers, a broker with Childers Sotheby's International Realty in Normandy Beach, N.J.
Lisa Jackson, broker and owner of Rockaway Properties in the Belle Harbor section of Queens, N.Y., said a number of her new listings are homes owned by senior citizens. One 85-year-old client was living alone in her 1940s-era six-bedroom, six-bath brick home right on the beach. The house was hammered by Sandy, and must be at least partially demolished, but will still command a hefty price. "Everything on the water is big money," Jackson said. But the $3 million listing price is nevertheless a huge discount from the roughly $4.25 million it would have commanded before the storm. Copyright 2013 The Associated Press. The information contained in the AP news report may not be published, broadcast, rewritten or otherwise distributed without the prior written authority of The Associated Press. Active hyperlinks have been inserted by AOL. Rising floodwaters caused by Hurricane Sandy rush into a subterranian parking garage on Monday in Manhattan. Sandy's storm surge was estimated to affect hundreds of thousands of homes along the East Coast. Vehicles are submerged on 14th Street near the Consolidated Edison power plant in New York. The storm forced the shutdown of mass transit, schools and financial markets, sending coastal residents fleeing, and threatening a dangerous mix of high winds and soaking rain. It ranks high among other recent natural disasters that have destroyed urban areas. A general view of submerged cars on Avenue C and Seventh Street in Manhattan after severe flooding caused by Hurricane Sandy, with widespread power outages and significant flooding. Lower Manhattan goes dark during Hurricane Sandy. Power has been out in parts of New York all week and might not be turned back on until the weekend. It may make many consider whether to buy a standby generator. The town of Long Beach, N.Y., is submerged by the storm. It was one area where homeowners were desperately trying to prepare for Hurricane Sandy's onslaught. A person tries to cross the street in Atlantic City, N.J., as Hurricane Sandy churns toward the East Coast. The city was like a ghost town, with casinos shuttered, tourists fleeing and many parts of the town inundated in knee-high water. A home in Manalapan, Fla., shows the severe damage it sustained when Hurricane Sandy passed through. Many homes were left ravaged in the wake of the storm, leaving homeowners worried about what their insurance would cover. A wave crashes against the shore in Montauk, N.Y., while a person stands on a porch as Hurricane Sandy moves up the coast. Aerial view of the coast in Belmar, N.J., after Hurricane Sandy left widespread damage along the Eastern Seaboard. Homeowners are likely to be turning their attention to how to recover from the storm. Homes are left destroyed on Highland Street in the Tri-Beach area in Milford, Conn., by Hurricane Sandy. For people in hurriance-prone areas of the country, here's how to hurricane-proof your home. Waves wash over a ruined roller coaster from a Seaside Heights, N.J., amusement park, after the pier beneath the Star Jet coaster collapsed into the Atlantic Ocean during Hurricane Sandy. New Jersey got the brunt of the massive storm, which made landfall in the state. Caleb Lavoie, 17, of Dayton, Maine (front), and Curtis Huard, 16, of Arundel, Maine, leap out of the way as a large wave crashes over a seawall on the Atlantic Ocean during the early stages of Hurricane Sandy in Kennebunk, Maine. Sailboats rock in choppy water at a dock along the Hudson River Greenway in New York. Waves pound a lighthouse on the shores of Lake Erie near Cleveland. High winds spinning off the edge of Hurricane Sandy took a vicious swipe at northeast Ohio, uprooting trees, cutting power to hundreds of thousands, closing schools and flooding parts of major commuter arteries that run along Lake Erie. Firefighters look up at the facade of a four-story building on 14th Street and Eighth Avenue in Manhattan that collapsed onto the sidewalk during Hurricane Sandy. Downed power lines and a battered road is what Hurricane Sandy left behind as people walk off the flooded Seaside Heights island. Richard Thomas walks through the floodwaters in front of his home after assisting neighbors in Fenwick Island, Del. People wade and paddle down a flooded street as Hurricane Sandy approaches in Lindenhurst, N.Y.
An ambulance is stuck in more than a foot of snow near Belington, W.Va, in Sandy's aftermath. The storm buried parts of West Virginia under more than a foot of snow, cutting power to at least 264,000 customers and closing dozens of roads. At least one death was reported. The view of storm damage over the Atlantic Coast in Mantoloking, N.J. Americans sifted through the wreckage of Hurricane Sandy after the storm passed, with millions left without power. The storm carved a trail of devastation across New York City and New Jersey, killing dozens of people in several states, swamping miles of coastline, and throwing the tied-up White House race into disarray just days before the vote. A woman walks over the flooded streets of Hoboken, N.J., after Hurricane Sandy hit. The storm was one of the largest in history to hit the East Coast. A parking lot full of yellow cabs is flooded as a result of Hurricane Sandy in Hoboken, N.J.
A 168-foot water tanker, the John B. Caddell, washed ashore on New York's Staten Island from Hurricane Sandy's powerful winds. Brian Hajeski, 41, of Brick, N.J., reacts after looking at debris of a home that washed up on to the Mantoloking Bridge in Mantoloking, N.J., the morning after Hurricane Sandy rolled through. Foundations and pilings are all that remain of brick buildings and a boardwalk in Atlantic City, N.J., after they were destroyed by Hurricane Sandy. This aerial photo shows burned-out homes in the Breezy Point section of Queens, N.Y., after strong winds whipped a fire into an inferno. The tiny beachfront neighborhood had been evacuated before it was inundated by floodwaters, transforming a quaint corner of the Rockaways into a smoke-filled debris field. A fire fighter surveys the smoldering ruins of a house in Breezy Point. More than 100 homes were destroyed in a fire which swept through the oceanfront community during Hurricane Sandy. A car is buried in sand that was washed in from Hurricane Sandy in Long Beach Island, N.J. In this aerial photo, people survey destruction left in the wake of Hurricane Sandy in Seaside Heights, N.J.
Jim Margiotta digs sand out from under his garage door, which was caused by Hurricane Sandy, in Long Beach, N.Y. This aerial photo shows a collapsed house along the central Jersey Shore coast. Heavy surf caused by Hurricane Sandy buckles Ocean Avenue in Avalon, N.J.
Cars are submerged at the entrance to a parking garage in Manhattan in the aftermath of Hurricane Sandy. A wall of seawater and high winds slammed into the city, destroying buildings and flooding tunnels. A woman stands near destroyed homes in the aftermath of Hurricane Sandy in the Rockaway section of Queens, N.Y. The death toll has risen to nearly 100 in the U.S., with 41 in New York City alone. Boats are piled on top of each other at the Morgan Marina near Sayreville, N.J.
A man walks by the remains of part of the historic Rockaway boardwalk in Queens, N.Y., after large parts of it were washed away during Hurricane Sandy. Waves break in front of a destroyed amusement park wrecked by Hurricane Sandy in Seaside Heights, N.J. This aerial photo shows burned-out homes in the Breezy Point section of Queens, N.Y., after a massive fire that was fanned by Hurricane Sandy's winds. Robert Connolly, left, embraces his wife, Laura, as they survey the remains of the home owned by her parents that burned to the ground in Breezy Point. At right is their son, Kyle. Andrew Seemar, 13, removes items from a room as he and his mother, Kathleen, clean up after their home in Brick, N.J., was flooded during Hurricane Sandy. Rescuers bring people out by boat in Little Ferry, N.J., in the wake of Hurricane Sandy. Olivia Loesner, 16, hugs her uncle, Little Ferry Deputy Fire Chief John Ruff, after she was rescued from her flooded home in Little Ferry, N.J. The remains of homes destroyed by a fire that swept through the Breezy Point neighborhood in New York City's borough of Queens. Brian Hajeski, 41, of Brick, N.J., reacts as he looks at debris of a home that washed up on to the Mantoloking Bridge in Mantoloking, N.J., the morning after Hurricane Sandy rolled through. Virgen Perez, left, and her husband, Nelson Rodriguez, center, look around their home which was flooded by Hurricane Sandy in Atlantic City, N.J.
Johnny Adinolfi is comforted by neighbor John Vento, right, as he stands in what was once the living room of his home in the aftermath of Hurricane Sandy in Massapequa, N.Y.
People take photos of water filling the Bowling Green subway station in Battery Park in Manhattan as New Yorkers cope with the aftermath of Hurricane Sandy. This satellite image shows the monstrous size of Hurricane Sandy before it made landfall on the East Coast. Should You Buy a Standby Generator for Your Home? Find out how to calculate mortgage payments. Find homes for sale in your area. Find homes for rentin your area. Follow us on Twitter at @AOLRealEstate or connect with AOL Real Estate on Facebook.